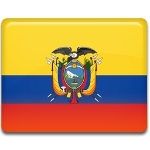 August 10 is National Day in Ecuador. This holiday celebrates the day, when Ecuador declared independence from Spain in 1809. As well as many countries of Latin America, Ecuador was colonized by Spain. The era of colonization lasted for about 300 years for the countries, until the colonies decided to declare independence. Independence of Ecuador was declared on August 10, 1809 in the city of Quito, that at that time was a small city numbering 10,000 inhabitants. A new government was formed, that didn't submit to Spain. The independent government lasted for about two months, however, it laid important foundation to beginning of movement of independence in Ecuador and the rest of Spanish America. Although Quito declared independence from Spain, it had no power. Moreover, the independence movement started the Ecuadorian War of Independence, that was fought from 1820 to 1822. The first city in Ecuador, that gained independence from Spain, was Guayaquil. This occurred on October 9, 1820, and anniversary of this event is observed as Independence Day in Ecuador. Ecuador gained full independence from Spain only on May 24, 1822, that is another public holiday, Battle of Pichincha Day.